With a disorienting lurch and a moment of falling through space, the group found themselves standing in another menhir in another forest. Oddly, there were townspeople sitting on the ground around them, picnicking. Some of them seemed startled and a man in green robes approached the group. He asked how they got here and where they were from and after some explanation the man seemed placated. 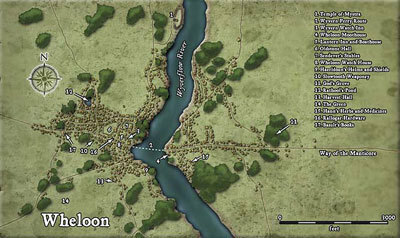 Dervilla asked some of the picnickers to clear out, "unless you want to visit Aglarond", as she put it. She explained to the PCs that they were in the God's Grove, a shrine to Silvanus in Wheloon, and she began preparing the menhir to take her back to the Yuirwood. Helios asked the druid if he knew if any clerics in the city had received strange visions from their gods. Silas asked him if there were any strange happenings in the Vast Swamp. The druid didn't seem to know on either account, but he directed the group to the local tavern (The Wyvern Watch Inn) to see if any local adventurers had any news of the swamp. The group left for the tavern, crossing the Wyvernflow (almost getting arrested because of shenanigans) on the ferry. Upon entering the establishment Silas ordered 2 beers and announced to the patrons that Aenin would be buying a round for everyone. Helios spotted a notice on the tack-board near the entrance and engrossed himself in that. The mage drew the attention of the group and showed them the notice which read; "For those of adventurous spirit and inquisitive mind, I have an vexing riddle to pose to you. Meet me, the man in blue, at the Wyvern Watch Inn before the 21st if you would venture to solve it. -TD". With a quick survey of the common room the group spotted 'the man in blue' sitting at a booth by himself. Silas snatched the note from Helios and made his way over to the booth with the group on his heels. He slid into the booth across from the man and presented the note. The man in blue looked a bit surprised, he said he was glad for Silas' interest but he was hoping for more than one person. Silas gestured to the rest of the group standing nearby and the man perked-up considerably. He introduced himself as Tunaster Dranic, itinerate priest of Mystra. Tunaster went on to descibe his encounter at the new temple of Mystra there in Wheloon. Apparently he sensed something was amiss and ran from the place. Strangely, the temple guards fired arrows at him as he ran. Why would a temple of the Lady of Mysteries, if thats truly what it was, fire upon one of their own? Tunaster also found it suspicious that he hadn't heard of this temple's construction until he entered the city a tenday ago. This was the only temple of Mystra in Cormyr, why wouldn't he have heard anything about it from his superiors in the Tower of Knowledge in Sembia? He feared something was very wrong about the temple and he wanted the PCs to investigate. The group talked it over amongst themselves shortly and decided to accept the task. Tunaster payed the group 500 gp then and gave them a promissory note for 1000 gp more that they could claim at any temple of Mystra (except the one in Wheloon). He told the group that he would be leaving on the morrow for the Tower of Knowledge in Saerloon to inform his superiors of his suspicions. The trip would take him a tenday or more. Tunaster thanked them for their bravery and left to make preparations for his departure. The sun was fading fast outside, it was around five bells that the group began formulating a plan. They decided that asking around for rumors on the new temple would be a good place to start. But they also wanted to scope the temple to see what exactly they were up against. So they broke the first cardinal rule of playing D&D; "don't split-up the party!". Silas, Helios and Nimmik proceeded to the temple of Mystra while Percival and Aenin made their way to the temple of Chauntea. In the waning dusk light, the spellcasters and spelltheif ambled quietly to the outer perimeter of the new Mystran temple. Using his new goggles of arcane sight, Silas scanned the outside of the temple for any dweomers. There were none to be found. He decided he needed to get much closer to see anything relevant, so he stealthily moved up to the guardhouse located a short distance from the temple. Moving closer, Silas noticed two guards on a battlement on the temple. When he got right up to the guardhouse he peeked inside and saw two guards playing a game a dice and chatting. The room they were in looked as if it could rest as many as six guards. The guards weren't talking about anything especially interesting or incriminating so Silas made his way back to Nimmik and Helios. He described what he'd seen and they decided that was enough for the evening. They headed back for the inn. Meanwhile, Percival and Aenin were asking questions about the new Mystran temple to one of the initiate priestesses of Chauntea. She proved quite helpful and honest in her answers, divulging that recently a local bookseller had gone missing and that there had been reports of strange lights and noises coming from the temple. The disturbances were reported to the town guard, whom made a cursory inspection, but were dismissed as something to be expected from a temple devoted to a goddess of magic. The speed at which the temple was erected also truck the priestess as odd, but again, if your matron is the goddess of magic most feats are a small matter. The fighters decided then to move on to the home of the missing bookseller. The shop was closed for the evening but they were able to speak with the bookseller's wife. She explained that her husband (Amnic Basult by name) had visited the temple and suspected something was amiss. She said he had done some research on the tenants of the Mystran faith and that this temple was somewhat deviant from the norms. He had posed his concerns to the local guards but they assured him that they'd already inspected the temple and found nothing wrong. Amnic was last seen in his bookshop, closing the store for the evening, almost two tendays ago. Satisfied with the information they thanked the worried wife and made their way to the barracks. They spotted a few Cormyrian Purple Dragons standing about just outside. They made their way up to them and after some wary question of their purpose by one of the knights, they were free to ask a few questions of their own. Aenin asked what they found on their inspection of the new temple and if they'd discovered any news on the missing bookseller. The knights didn't have any useful info on either topic, so the duo decided to return to the Wyvern Watch. With the group whole once again, they began to really plot their ingress to the temple. Ultimately they decided to go semi-incognito and scope the inside as common adventuring patrons. Silas and Nimmik decided to play themselves off as traveling minstrels from Aglarond and Percival and Aenin were to be their bodyguards. Helios would pose as an associate sorcerer. With Silas' hat of disguise and Nimmik's ability to bind to Naberius, it was sure to be a convincing cover. The following day, after preparing their spells and pacts, they made their way to the temple. Nimmik stopped along the way to purchase a lute. If they were to be convincing they were going to have to follow through. 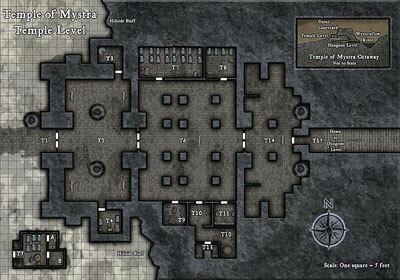 After a few practice riffs and a few mildly entertained townspeople they continued to the temple of Mystra. Upon entering they noticed the open-air courtyard and the large pair of statues. A few other patrons were milling about, praying at the four shrines located therein. Silas and Nimmik made a big to-do when looking around. They exclaimed (loudly) at the beauty of the temple and glorious poems they'd compose in its honor. With the attention pulled squarely on them, Nimmik began to play a rather nice number on his lute while Silas did a not-so-impressive jig. One of the priest approached the group wishing them Mystra's blessing. He introduced himself as Father Shan Thar. Nimmik and Silas went on and on about the glory of the new temple and how they would "compose a book of sonnets" about it. The rest of the group asked a few prying questions about the purpose of having guards and the segregation of the temple areas. Father Thar explained that occasionally beasts from the Vast Swamp, hyrdas and trolls and such, have been known to menace the area. Silas exclaimed that he would write a song about hydras and he and Nimmik began to improvise a song on the spot which turned out to be an excellent performance (natural 20 on Nimmik's perform roll). Shan Thar seemed very good humored about all of this and even applauded. He told the group that if they were interested in receiving "Mystra's Sacred Trust" and access to the inner chambers of the temple, that they should return that evening with 25gp each to start the three day ritual. The group agreed to return and left spouting nonsensical songs all the way (incidentally, the group made about 10gp that day from Nimmik's playing). That evening the group returned with money in hand. A few other common patrons arrived as well. Father Shan Thar greeted them all and proceeded with the evening mass. It seemed a fairly common sermon, according to Helios, aside from the illusory night sky created by an accompanying sorcerer. After the mass all but one of the common patrons took their leave. Shan Thar welcomed them and asked for their donations. He then ushered them into the middle-temple where another priest was waiting. This one was much older that Shan and he had a very gruff, no-nonsense look about him. He introduced himself as Starweaver Fembrys and gave the assembled patrons the gist of what was to be expected of them in the next few days. The group was then shown to their quarters and were asked to don the ceremonial black robes waiting for them on their cots. Once dressed the PCs plus one assembled back in the middle-temple for Fembrys' sermon. It was a confusing, hard to follow tirade. But Helios determined that the sum of the message was; "true power lies between the stars". Afterward the group was ushered back to their quarters to rest for the night. But rest they did not, at least for a while. They began plotting the best way to inspect the area. One guard remained by the inner doors and it was likely that the guards had a room adjacent to theirs. Silas and Aenin decided to reconnoiter, using some of Nimmik's invisibility spells. They moved easily past the guard and Silas inspected the eastern door on the southern wall. The room was locked but nothing too difficult for "Pick" Porter. Inside he found the sacristy. Various gilded items were displayed in a windowed cabinet as well as ceremonial robes (fitted to wear over plate armor) in a pair of smaller cabinets. Eyes wide with greed, Silas began to shovel the golden relics into his sack. He noticed a book among the treasure and recognized it as the book from which Fembrys read during his sermon. Putting two and two together, Silas decided that taking these items or even disturbing them may arouse suspicion. So, in a display of godly restraint, the spelltheif replaced the items in their general location and left the room. Meanwhile, Aenin inspected the next door to the west. It was unlocked and inside was a privy and water closet, complete with a makeshift shower. Silas met-up with the fighter back in the main temple area and they chatted a while. Unfortunately it was a little too loud and the guard heard them. He made his way over to inspect, but since the PCs were both invisible he dismissed it as noise from the guard-room. With renewed caution, the PCs moved on to the next door which was also unlocked and found a mundane storage closet. Aenin could feel his invisibility enchantment beginning to wane so they quickly returned to their resting quarters. Just as they slipped inside Aenin's invisibility wore off. He and Silas described what they'd found to the other PCs and Nimmik pointed out that Silas forgot to lock the sacristy door. With a headslap, Silas rushed back as stealthily as he could and re-entered the sacristy. He looked over the gilded items with envy and it occurred to him that he had put them back in the wrong arrangement. Silas quickly rearranged the relics, re-locked the sacristy door, and hurried back into the resting quarters. They all decided that they'd had enough excitement for one evening so they all rested. The spellcasters awoke early the next morning to prepare spells and pacts before their hosts called on them. The day was uneventful aside from bathing in the morning and sparse meals throughout. In the evening they all attended another sermon by Fembrys, much like his first. The next two days passed much in the same way. On the evening of the third day Fembrys gathered 'the PCs plus one' in the inner temple. This chamber was much different from the other two areas of the temple; Obsidian slabs tiled the chamber floor to ceiling, and the lighting left much of the room in shadow. Things were staring to smell very fishy to he group. Fembrys announced that the group was ready to receive "Mystra's Sacred Trust". As he began his sermon he drew forth a grapefruit-sized crystal globe from within the altar and held it before him. It was a dark black thing with points of light dotting the surface. As the PCs gazed upon this item they felt their wills dominated. Only Nimmik and Percival were able to shake off the effect. As Fembrys continued his sermon the mage and the knight began to realize that they were the only two unaffected by whatever Fembrys had done. Nimmik slyly handed Percival his hammer from within his concealed Heward's handy haversack and drew forth a wand and kept it hidden at his side. As Fembrys was finishing his sermon Nimmik blasted him with a shadowspray from his wand. The cleric shook it off and declared incredulously; "How dare you assault a cleric of Mystra! Guards!". Two shadow figures emerged from the dark, flanking the group. They appeared somehow unnatural. Percival brandished his Lucerne Hammer and told Fembrys to "Stand Down!". He prepared to strike at the cleric if he did not heed the warning. Meanwhile, the dominated PCs seemed confused and disoriented. Nimmik drew another wand and blasted one of the guards with color spray, knocking him unconscious. Silas moved to the other guard and asked what was happening as the guard tried to blend into the shadows. Fembrys demanded that the dominated PCs restrain the two trouble-makers and, since that was not 'standing down', he received a healthy smack across his jaw from Percival. A natural 20 with Mountain Hammer strike (42 dmg!) nearly tore the clerics jaw from his head and he was knocked into a deep coma. With the dominator no longer dominating the rest of the group snapped out of it. Aenin spotted the other guard trying to sneak up on Helios. He quickly grabbed his sword from Silas and beheaded the sneaking guard. With the threat doused they searched the unconscious "cleric of Mystra" and gave him a point of healing to prevent him from dying before they questioned him. On his person they found the incriminating evidence they'd been looking for; Chakrams, the signature weapon of Shar and her clergy. Now the group faced a few new questions; Do they report the evidence to the town guard as soon as possible, was everyone in the temple in-on the ruse, and did they yet have enough convincing evidence?